With another live action Disney remake on the horizon; "Beauty and the Beast," I thought it would be interesting to look at another thing that Disney used to do before they decided it was a good idea to remake and/or create live action spin-offs of some of their most well-known films. Many people consider the late 1980s and early 1990s the Renaissance of Disney Animation. And that's a fair point. From "The Little Mermaid" to "The Lion King," from 1989 to 1995, you could throw a rock and hit a great Disney Animated Film. But with great box office, comes the need for more money! Normally the first step was to release it on VHS in the giant clam-shell case and warn everyone that if you don't buy it quick it will go into "The Disney Vault." Their next step was something that no other studio did, at least at the time; Direct to VHS Sequels! One of the most memorable offering was "The Return of Jafar." 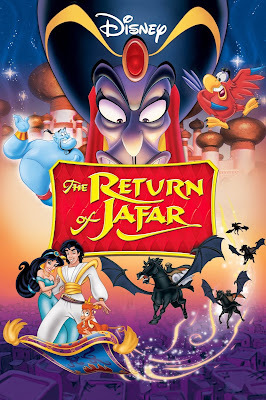 After the success of "Aladdin" in 1992 it only seemed natural to release a sequel, and to be fair, "The Return of Jafar" isn't that bad and it marked the first Straight-to-VHS sequel that Disney had released. The one drawback was the lack of Robin Williams, but that was later rectified in the inferior 2nd sequel, "King of Thieves." To not take the piss out of this post, I can honestly say that I haven't seen another Direct-to-Home Video Disney film, but here are just a few of some of the other winners that you can still find in those giant clam shells. Not exactly a Murderer's Row of Disney excellence, but they are still an important part of Disney history. Fun fact, "Toy Story 2" was originally supposed to go Direct-to-VHS, but in a late decision, it was released to the theaters. Consider what could have been if the decision was to actually relegate such an early Pixar film to what I would consider "film purgatory." Bringing this back around, will the live-action "Beauty and the Beast" be any good? Who knows, but in all honesty, was "Maleficent" and good? Was "Cinderella" really any good? This seems to be the new normal for Disney at this juncture and only time will tell if this new wave of live-action remakes will go the route of the doomed Direct-to-VHS experiment.